In addition to getting my Hashimoto’s into remission, I am working on improving my overall health. If you suffer from Hashimoto’s, it’s very likely that you’re a bit overweight like I am, so I’m sure you know where I’m coming from. My brother and sister both do yoga, so I was inspired to try it. I looked up yoga for beginners on YouTube. The video I tried, either the person doesn’t know what I mean by “beginner” or there is another category below beginner that I just don’t know about. Haha! So, I quickly went back to searching, this time on “yoga for overweight beginners”. Jackpot! I found a video (that’ll I’ll share below) that really fit my idea of “yoga for overweight beginners”. The lady in the video was much more overweight than I am and was recovering from a knee injury. That really motivated me, because if she can do it, I can do it, right? She made it clear she was not an “expert”, but was sharing her modifications she’s made to allow her to continue to become more flexible and fit. She kept mentioning her pants didn’t fit well because she’d lost so much weight. Bonus! The instructor not only shared the modifications she made, but she made it entertaining to boot. I appreciated the fact that she didn’t seem self-conscious at all and really put herself out there in order to help others struggling like she had. Honestly, I’m not that confident yet to put myself out there like her, but I’ll get there. I’ve subscribed to her channel. If you find her videos helpful, please subscribe to her channel too and/or leave some comments. She also runs a plus size yoga support group for those that are interested. If this post has helped you, please leave a comment below and let me know so I’ll post more things like this. If you know someone else this post might help, please share it on social media! Join our mailing list to receive the latest Hashimoto's Thyroiditis news and updates from our site. Join our newsletter to get news & updates! Brain Fog: What is it and what can you do about it? Use natural therapies to support your thyroid and get rid of ovarian cysts. Could a Sluggish Thyroid Make You Fat and Tired? 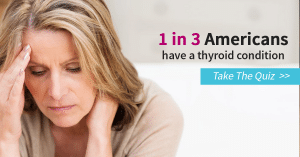 Click to learn about three big thyroid problems that many people ignore.